There is considerable optimism amongst policy-makers that greater use of digital health technologies (‘telehealth’) in combination with new ways of working could transform health care delivery, helping the NHS to be sustainable in the face of rising demand. But in a study published today in the British Medical Journal (BMJ), researchers conclude that, while telehealth could provide some benefit to some patients, it is not a simple answer to a complex problem. Led by researchers from the University of Bristol’s Centre for Academic Primary Care, the Healthlines study aimed to evaluate the effectiveness and cost-effectiveness of a new telehealth service. The trial of the Healthlines Service involved participants receiving regular telephone calls from a health advisor who supported them in addressing their own health goals and directed them to relevant online resources, or sent them the information by post. 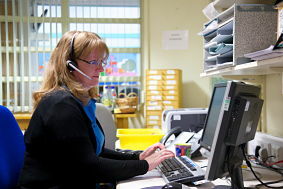 The researchers recruited 641 adults with a high risk of heart disease or strokes (cardiovascular disease) to a randomised controlled trial of the Healthlines Service – half the patients were given usual care while the other half were given usual care plus contact about once per month from a Healthlines Service advisor. They looked for improvements in the participants’ risk of cardiovascular disease, blood pressure, weight, body mass index, cholesterol and smoking status. In a separate paper, published recently in Lancet Psychiatry, the researchers describe using the Healthlines Service to support patients with depression. Compared with usual care alone, intervention participants reported small improvements in depression and anxiety, better access to support and advice, greater satisfaction with the support they received, and improvements in self-management. The research team, which was funded by the National Institute for Health Research (NIHR), involved colleagues from the University of Sheffield, Bristol Randomised Trials Collaboration, NHS England South (Wessex), University of Southampton, Royal College of Surgeons in Ireland, Nottingham Clinical Trials Unit, Solent NHS Trust and NHS Direct. The team is now analysing the cost-effectiveness of this intervention in detail and hopes to publish its results before the end of the year.